If you are new to Yoga, or just getting started, the myriad of information out there can feel a bit overwhelming. Not only are there a bunch of different class types to choose from, some of the poses are in Sanskrit and there are some rituals like bowing to the teacher and saying ‘namaste’ which can be quite overwhelming at first. It takes a bit of courage to take that first step onto the mat, but if you are ready and willing, here is all you need to know to make you feel ready to get flowing with Yoga. Yoga is more than fitness and meditation. It is a way of life that has developed over 5000 years, beginning in India and fast spreading through the United States and now in the West. There are a myriad of ways that Yoga is great for your mind, body and soul. Yogi’s have been walking this path to enlightenment or bliss. To experience bliss, they have found dietary requirements, physical activity, meditation, breathing exercises and ethical guidelines to live by. Western medicine also states now that when you regularly practice Yoga, you can breathe better, reduce symptoms of depression and anxiety, decrease blood pressure and more. Yoga can make your experience of life more positive. Whether you want to practice at home or in a local studio, do a little bit of research in order to find the right teacher for you. In ancient times, when Yoga started about 5000 years ago, the practice was taught from one teacher to one student. Every teacher has a different style and approach, so it can be useful to look at the bio’s of teachers with positive reviews and see if they resonate with you. If you want to take a class at a studio or gym, they will most likely have all the equipment you will need, but if you are going to start a home practice you might like to invest in a Yoga mat and some props like a block and meditation pillow. If you will be going to a studio, you can call them up before to make sure what you need to bring with you. Think about what you will wear to the class too. If you are going for a relaxing or slow-paced class, you might want to wear something warm, whereas for a more active class style, make sure to wear comfortable clothing that will make you feel at ease in any posture. Revealing clothes can become uncomfortable if they fly over your head when you are going from one pose to another. And remember that the physical practice of Yoga is done barefoot. If you are shy about your feet you could look for some socks that have grippy things on the soles. In most group Yoga classes the structure follows a similar script. Although each teacher is unique and will have their own style, there will still be some steps alike in the stucture of each class. If you are going to class at a studio, show up early to introduce yourself, especially if you are new and to set yourself up in the space without stressing about time. Yoga classes generally begin with a short meditation to bring the mental awareness into the present moment and onto the mat. Sometimes breathing exercises are taught at the beginning of a class too. Then just follow the flow with the teacher. There should be a generous warm up, followed by some seated or standing postures. Classes build up in speed and intensity and at the end there is time for cooling down, finishing with ‘savasana’ or the corpse pose, which is important relaxation time in which the body and mind take in everything that has been learned during this practice. Make sure to place your mat closer to the teacher if you want to get more individual attention. If you hide in a corner or in the back, you make it more difficult for the teacher to assist you into safely executing the poses. Basic etiquette means respect your teacher, respect your fellow students and respect yourself. For example leave your phone in a locker, or if you need to be reachable, let you teacher know that before the class. Or if you are late for a class, enter quietly. If you need to leave early, again let your teacher know before the beginning of the class in order to avoid disrupting or distracting others in their practice. Would you like to learn more about the history, philosophy and basics of Yoga? This article is written by Sara Doguelli, a Yoga teacher who strives to help others finding balance and joyfulness in life. Sara and Core Active will be hosting ‘So You Think You Can Yoga?’ a series of 6 weekly classes, which are 1,5 hours each. Starting on Friday, January 11th 2019 these courses will build your foundational knowledge of Yoga. 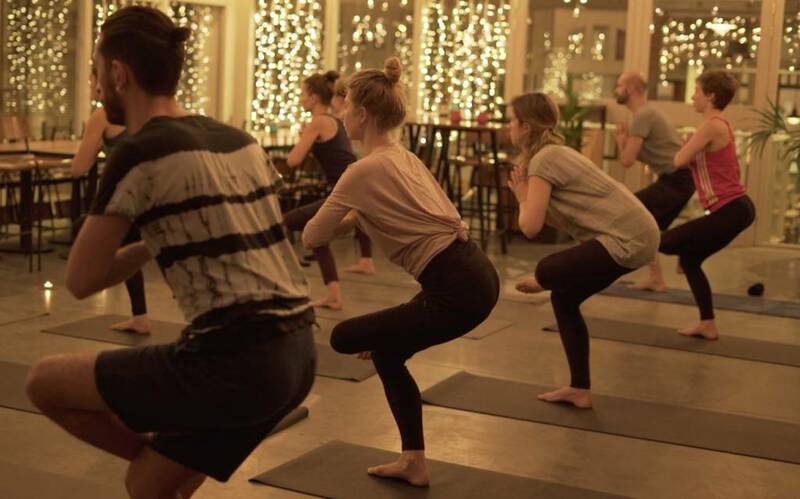 Covering the history, philosophy and basics of starting a Yoga practice, this course offers a unique approach to learning Yoga in Amsterdam. Sign up is possible via this link and if you have any questions you can email Sara at sarayogelli@gmail.com.